The Story of Civilization by Will and Ariel Durant is an eleven-volume set of books. It was written over a lifetime, and it totals two million words across nearly 10,000 pages. The series is incomplete: in the first book of the series (Our Oriental Heritage, which covers the history of the East through 1933), Mr. Durant stated that he wanted to include the history of the West through the early 20th century. 1993-07-05. New. Ships with Tracking Number! INTERNATIONAL WORLDWIDE Shipping available. Buy with confidence, excellent customer service! 1980-09-09. New. Ships with Tracking Number! INTERNATIONAL WORLDWIDE Shipping available. Buy with confidence, excellent customer service! Norwalk, Conn: Easton Press, 1992. 1st. 1st edition thus. Collector's Edition. 4to. 751,  pp. Index; Maps. Illustrations. Tan leather with gilt lettering & decoration; red & black leather title labels to spine; AEG; silk ribbon marker. moire endpapers. As new. 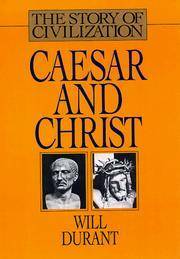 "A History of Roman Civilization and of Christianity from their beginnings to A.D. 325." Next day shipping. Celebrating our 20th year - all domestic orders ship with Delivery Confirmation Tracking Number - Images available upon request. Fine Communications. Hardcover. 1567310141 New Condition. . New. Fine Communications. Hardcover. 1567310141 Like New Condition. . Fine. Beautiful cloth covers, dj has 1 inch closed tear, top edge stained red, illustrated, indexed, pp751, map end pages, sewn map into binding. Fine Communications, 1994-07-01. Hardcover. Used:Good. Simon & Schuster, 1980-12-25. Hardcover. Used:Good. 1993-07-05. Good. Ships with Tracking Number! INTERNATIONAL WORLDWIDE Shipping available. May not contain Access Codes or Supplements. May be ex-library. Shipping & Handling by region. Buy with confidence, excellent customer service! Fine Communications. Hardcover. 1567310141 Different picture on dust cover. New Inside and Out. Clean and crisp pages w/no markings! You will be pleased. Excellent book! ( z1s143D ) Some very minor shelf wear on dust cover. ** Fast Shipping! ** . New. Simon and Schuster. Hardcover. B001THWYUC New Condition. . New. Simon and Schuster. Hardcover. B000TK5PNI New Condition. . New. Simon & Schuster. Hardcover. 0671115006 New Condition. . New. 1980-09-09. Good. Ships with Tracking Number! INTERNATIONAL WORLDWIDE Shipping available. May not contain Access Codes or Supplements. May be ex-library. Shipping & Handling by region. Buy with confidence, excellent customer service! MJF Books. Used - Good. Ships from the UK. Shows some signs of wear, and may have some markings on the inside. 100% Money Back Guarantee. Your purchase also supports literacy charities. Book. Hardcover. 1st Edition. 1944 STATED NINTH PRINTING OF THE FIRST EDITION IN VERY GOOD CLEAN (ONLY BOOK PLATE) 751 PAGE HARDCOVER WITH ENDPAPER MAPS OF ITALY,SICILY AND ROME THAT ARE WONDERFUL REFERENCES OF THE PERIOD1. Simon and Schuster. Hardcover. B000TK5PNI Like New Condition. . Fine. Simon & Schuster, 1980-12-25. Hardcover. Good. New York: Simon and Schuster, 1944. Book. Very Good. Hardcover. 4to - over 9¾ - 12" tall. Eighth printing, stated. Black cloth with gilt. Boards clean, light shelf wear only. Binding sound. Text block lightly toned. Gift inscription on verso of frontispiece, else unmarked. DJ not clipped ($10.00) large closed tear across front panel; some light soiling and toning with a few small tears and minor chips. Light creasing. Shallow chipping at spine heel. Fold-out map intact and clean; small closed tear..
Simon and Schuster. Hardcover. B001THWYUC Like New Condition. . Fine. Simon & Schuster, 1944. Hardcover. Very Good. Nice looking book, has minor edge wear.dusk jacket is faded and has tears.Pages are slightly tan and not crisp white. Edito-Service, 1966. Hardcover. Good. 1966. Renewed Edition. 214 pages. No dust jacket. Green cloth with gilt lettering and decoration. Quarter bound. Contains photographic plates. Bright pages with light tanning to endpapers and page edges. Rub marks and a couple of tiny nicks to text block edges. Faint tanning along spine and board edges. Mild rub wear to surfaces and edges with minor bumping to spine ends and corners. NEW YORK CITY, NY, U.S.A.: SIMON AND SCHUSTER, 1944. 1st Edition 2nd Printing. Hardcover. Very Good/No Jacket. 8vo - over 7¾ - 9¾" tall. The Story of Civilization. New York. 2nd Printing. Hardcover. 751pp. Black cloth hardbound, gilt stamped title on spine cover/front boards. CONDITION: VERY GOOD+. The Story of Philosophy Transistion, The Mansions of Philosophy, Adventures in Genius, The Story of Civilizatiion: I. Our Oriental Heritage, II, The Life of Greece, III. Caesar and Christ. Fine Communications, 1994-07. Hardcover. Good. New York: Simon and Schuster. G/P. 1944. Cloth. Gold lettering on black boards. A little foxing under the boards. Map of Rome on the Front Endpapers, and Italy on the Rear Endpapers. 39 black and white plates. I have the original jacket, but it has been torn in two along the spine. The edges are in fair condition though, and I think it could be saved by placing it in a mylar cover or by applying acid free paper to the back. ; 8vo . Fine Communications. Hardcover. 1567310141 Item in acceptable condition including possible liquid damage. As well, answers may be filled in. Lastly, may be missing components, e.g. missing DVDs, CDs, Access Code, etc. . Fair. New York: Simon and Schuster, 1944. Very good hard cover. No dust jacket. Some wear and age.. Hard Cover. Very Good/No Dust Cover. Simon & Schuster, 1944-01-01. Hardcover. Good. .
Hardcover. Simon and Schuster, 1944. Good. . Condition: Simon and Schuster, 1944. Good. Simon & Schuster. Hardcover. 0671115006 Ships from Tennessee, usually the same or next day. . Good. 1980. NY: Simon and Schuster, 1944. Hardcover. Very Good  Used. Previous owner's name; small wear to cover. Nice condition. Simon and Schuster. Hardcover. B000OLEH7M . Good. Simon & Schuster. Hardcover. 0671115006 Missing dust jacket. Acceptable Condition. Five star seller - Buy with confidence! . Fair. Simon and Schuster. Hardcover. B000TK5PNI Missing dust jacket; otherwise in excellent condition. Acceptable Condition. Five star seller - Buy with confidence! . Fair.